[Columbus, OH] – Have those well-worn pants started to feel a bit too comfortable or perhaps a bit too restricting? 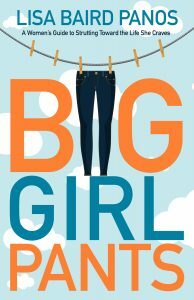 In her debut book Big Girl Pants released today, life coach Lisa Baird Panos provides the inspiration and encouragement to change those pants into ones more liberating and fulfilling. With her relatable, irreverent and empowering style, Panos weaves personal anecdotes, inspirational stories and quick exercises to help readers transform into self-assured, honestly happy people who are unapologetically themselves. The book, available as a paperback and an Amazon e-book, encourages readers to break a “Dead-end Cycle” of dream-excuse-dream and break-out of the self-imposed limitations designed to protect them from failure, freak-outs and criticism. Panos is a Certified Martha Beck Life Coach and resides in what she affectionately refers to as the “Bubble” of Upper Arlington, Ohio. A self-described “recovered Mean Girl,” she pulls from her own life experience of realizing that keeping up with the Joneses is futile and honestly, they’re pretty boring anyway.